Printing and coloring on Kraft Tex: Will It Work? It's been a while since I had the chance to get out my Kraft Tex again and try something new. If you've never heard of Kraft Tex before then check out these previous articles and you can see how versatile it can be. It's often described as paper-fabric or just recently I've seen people calling it vegan leather too (which might be a bit of a stretch! ), but pre-treat it and it can have a leather-like texture. I've heard that you can print on Kraft Tex and that it's also really good for arty projects such as painting, coloring, inks, and more. Well, we don't have an art shop here in Cayman so I was rather limited to what supplies I could find but that didn't stop me at least giving it a try. I've tried printing on fabric before and had awesome results so this seemed the ideal next project to try. I started with the Stone colored Kraft Tex and thought that would be a good compromise for printing and coloring. Not as dark as the Black or Chocolate but not bright like the white that could get grubby over time. You must have seen all of the adult coloring books and pages by now, and I admit, I love these but still haven't actually got one for myself. The Kraft Tex project seemed like the perfect chance to do both at once so I downloaded a free adult coloring page (under the sea of course) and resized it to fit 4 x 6 inches in my print settings. Then I cut a piece of Kraft Tex 6 x 4 inches, flattened it out with a hot dry iron, and when it was cool, just ran it through the printer. Success first time! I just gave it a little ‘tap' as it started to feed and it went through my regular home printer no problem at all. The picture was just printed in black but there's no reason you couldn't use color printing too, although then if printing in full color you might want to try the white Kraft Tex as your base. Experiment and see how you get on. The printing came out perfectly and I should have taken a photo but I was so delighted with it that I wanted to color it right away. So out came my ‘art supplies' which consists of a red and a blue Sharpie – I told you I was making do with limited art supplies! I doodled a few colors on there and this is the result. I like the look very much, although it was probably more classy without the Sharpies to be honest, just with the black line drawing. I'll know for next time. Now time to give it a good scrunch and boil it up for 5 mins and see what happens. Fingers crossed with those Sharpies… But oh dear, that didn't come out so well. The Kraft Tex has the lovely leather effect texture I was after and all the black printing remained perfectly. The Sharpies, on the other hand, didn't do too well and both the red and the blue ink ran and bled into the surrounds. Now it looks all mucky and blurry. In fairness, I don't suppose the regular Sharpies are designed to be boiled. This project gets officially tagged as a ‘failure'. However, as an experiment, I thought it went well. The printing was easy and came out really sharp and clear so I'll certainly be doing that again. 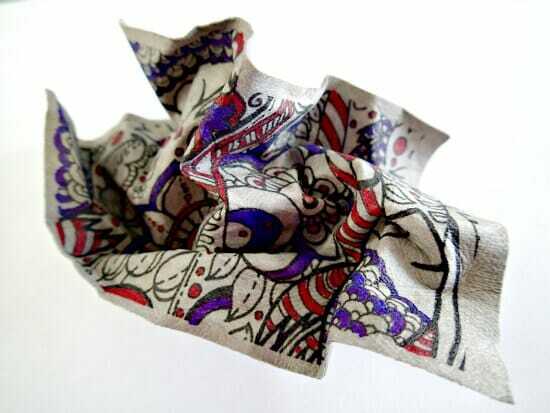 Now to come up with some ideas for how to use the printed Kraft Tex and look out for some new designs to use. Probably won't be using those Sharpies again although I hear they do make oil-based paint pens including in metallic colors such as silver, gold, and bronze. I bet those would look stunning on the black Kraft Tex background if you were artistic, which sadly I am not. 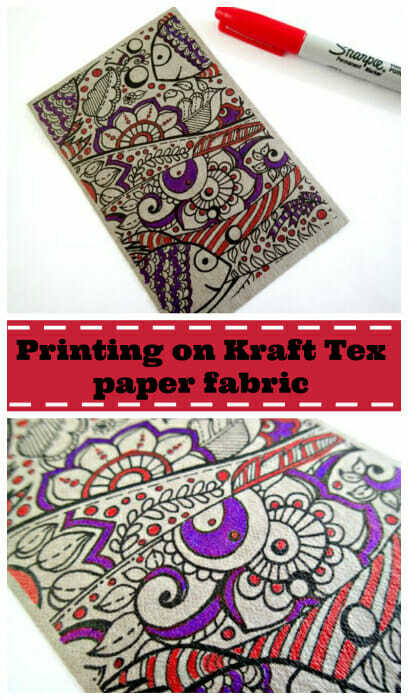 Have you ever tried painting or printing on Kraft Tex yet? Got any tips for products that work well and resist the boiling? Let me know your tips. 33 Responses to Printing and coloring on Kraft Tex: Will It Work? What actually brand of printer will work best with Kraft Tex? I want to pick one up soon but cant find much information. 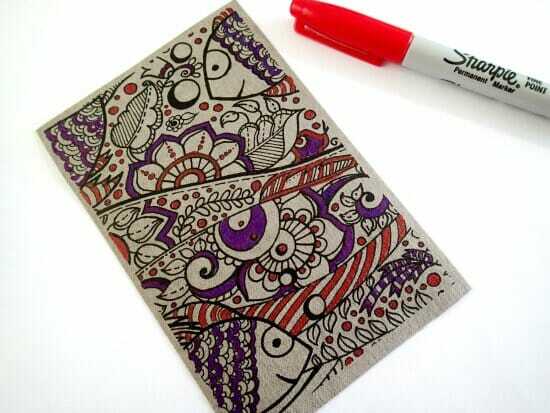 I think the crafted with that cute undersea motif would make a cute casual wallet. Thanks for the ideas…. I have used the markers with children. They decorated squares for their retiring teacher’s quilt. The finished quilt washed beautifully. All the colors stayed vivid and there was no running. Plus, the pens are long lasting and withstood handling by 20+ second graders. And an even bigger bonus, buying them won’t break your bank. Actually I loved the first one you did. I liked the look of the colors blending together. Thanks for the info. OK, so I am a little crazy, but I like Your first try! Really cool! Looks soft and well loved. I agree with Pamela. I wouldn’t call this project a failure. It has an “antique” flare to it and gives the impression of having stood the test of time. 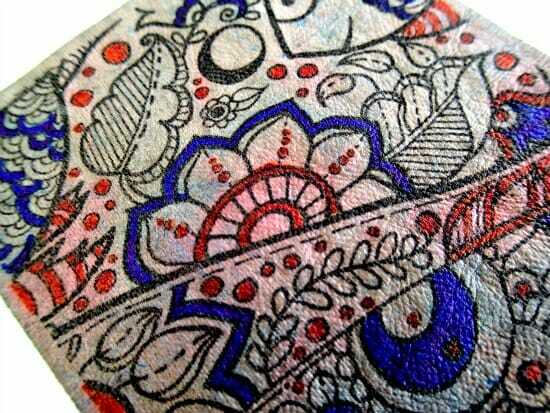 There are permanent fabric markers that can be washed. I would heat set with an iron first before washing. Will be looking to buy some Kraft Tex to try this idea. 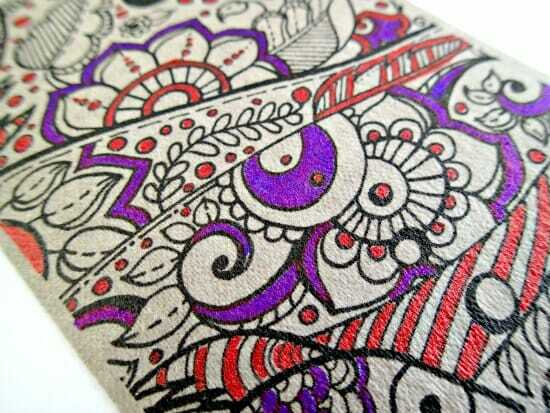 Would probably try some of the fabric pens I have to color. Is this product sewable? If so, I will try to use in some of the bags and purses I make. And as another reader suggested, greeting cards. Very interesting post. I have used kraft tex with embossing stamps and printed stamps. But never boiled them. I really liked how the embossing worked. 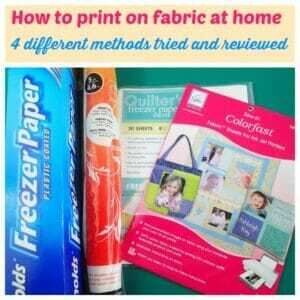 Did you have a post on printing on fabric too? Would like to try that. where can I purchase Kraft Tex. I am into using my embroidery machine to stitch out designs for card fronts. I am now using an embroidery backing and glue onto card stock. I would like to give Kraft Tex a try. Here is a link to the CT publishing store http://amzn.to/2poDrYK. Would it work if you printed the Kraft Tex, then boiled it, THEN colored it with the sharpies? 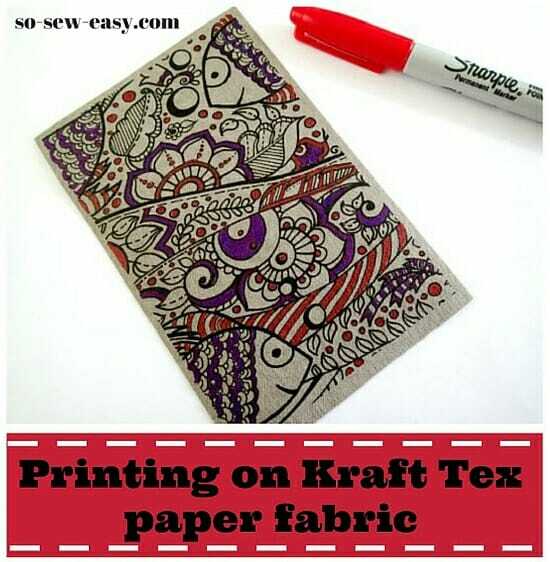 I have’t tried Kraft Tex yet, but I have used Sharpies on canvas and they worked well with regular washing. I did, using a dry iron, heat set the Sharpies first. Also, using a salt water rinse bath before regular washing helps set any type of dyeing/coloring/painting project! I learned this from Rit Dye. Hi Julie, make sure the printed ink will remain so you can follow then color with a sharpie. I think I will give it a try and update you. But, if you do it before I do please let me know. Let me know what ink you use for printing. I have actually tried the oil-based Sharpies and they work pretty well. Thanks for the feedback on the other types. I know this is an old post but I have only just found it and want to ask how the ink from your printer did not run. I printed on the untreated paper first and then decided to try and soften it later but all the colours ran. I notice you just used black and it didn’t run. Is your printer a ink jet or laser printer? HI Chris, use an ink jet printer only. But thanks a mil for this article – it was great to know that the printer ink didn’t smudge when wetted as I feared it might. You can use acrylic paint instead of Sharpies – I’ve done that before but it’s so much neater to have a printed framework. Your articles are the best! I have washed sheets of Kraft Tex in the wash machine with like colored clothes; after several washings it takes on a leather like look and feel, then I run it through my home computer. Works like a charm! I use the Kraft Tex for labels to attach to my handmade bags. Hi Chrystel, thanks for sharing this experience. Kraft Tex is still new to a lot of people so it is great to hear about some longer term results. I love your projects but this site is SOOO slow with all the competing ads. I realize you need to use some to pay for the site since it’s free to us. I use Chrome. Is there a better browser? Thx. Hi Deborah, try clearing your browser cache. There are actually no ads on that particular page except in the sidebar. If you’re seeing any they may be from old scripts in the browser cache or something. What type of computer are you using? You may want to try Firefox as Chrome seems pretty susceptible to holding on to bad scripts. The OPERA browser works really well and has a built in add blocker that you can turn on. I am loving it, though you will occasionally come to a site that it does not support as will all browsers. Hi Christine, thanks for sharing your experience. Deny! So happy to see a post by you! This (printing on Kraft Tex) fascinates me. I’ve been meaning to try the wallet, even bought the Kraft Tex, but other projects have been getting in the way. You know how that is! The first chance I get I’m going to tackle the wallet and put a cute printed design on the front! Thanks for the article! I haven’t used Kraft Tex, but why couldn’t you boil it and THEN color on it? I don’t think it was a fail. I think it just has a different look to it. Still pretty! Did you try setting the inks with an iron before washing? I wonder if that would help? Also could try putting a color catcher sheet in the wash. I wonder if Pigma pens would work better?